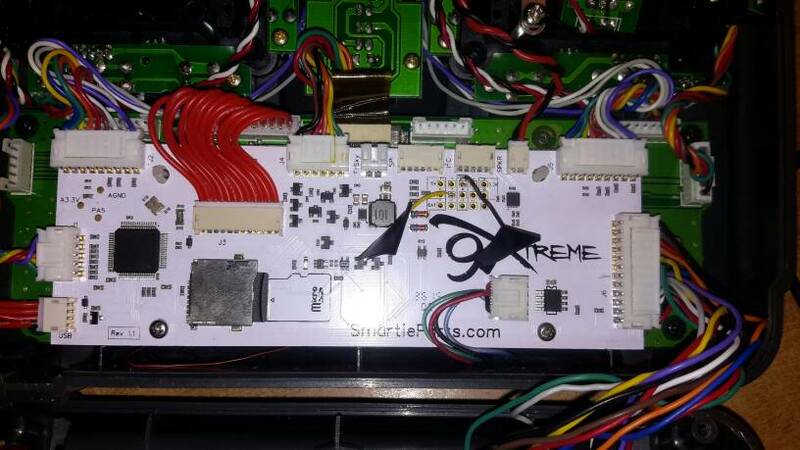 good news That means that the PPM pin on the 9xtreme is not damaged..
Everything seems to be working so I'm not sure what the problem is. This is what it does. Not the fast blinking of the green light which is failsafe. I'm a little bit away from buying a taranis but i've already spent some money AND work time at this tx and i love it, so I can't give up yet. How can i format the tx? And then install the rom again? I've found my V8FR and tested binding and operation with a DJT and the 9Xtreme. Turn on the V8FR while holding the button in, the RED led is on solid and the greem led is on but dimmer. Turn on the Tx while holding the button on the DJT pressed, keeping the button pressed until the splash screen and all warnings are cleared, then release the button. The RED led on the DJT flashes fast, as does the RED led on the V8FR, indicating bind complete. Turn on the Rx, the RED led flashes slowly, the green led is off. Turn on the Tx. When all alarms are cleared, the RED led on the DJT is ON, the green led is flashing fast. On the V8FR, the RED led is on solid, the green led is off (or may just be very very dim). A servo plugged into the Rx is able to be controlled. Please try this and let me know of any differences in the LED behaviour. ......and of course nothing.This is why i told you before for making a format.Maybe when i tried to slow down and up the camera at the beggining i messed with something i shouldn't. I say maybe it is a software issue. 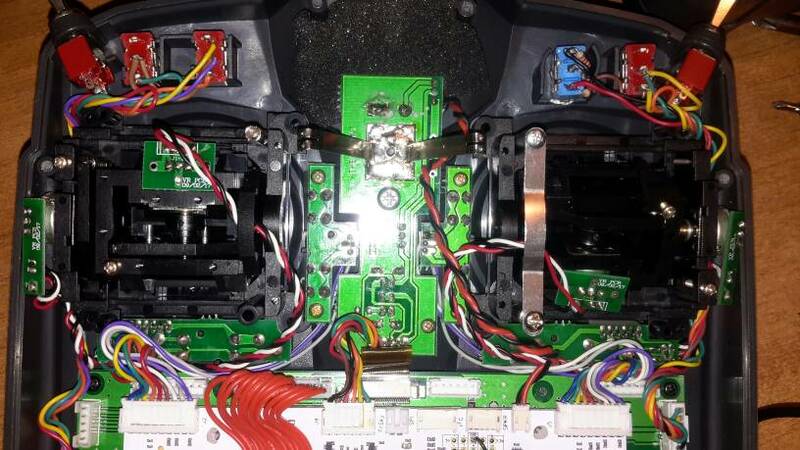 Besides my other turnigy transmitter (without 9xtreme) binds fine. The green led not flashing indicates the PPM signal is not getting to the DJT. 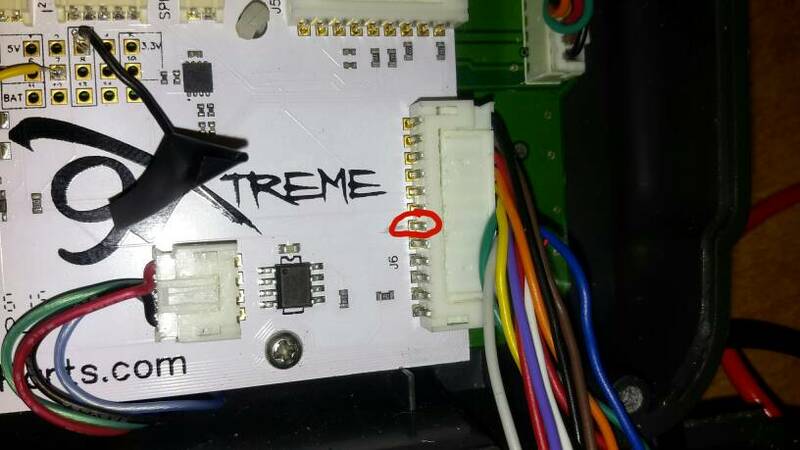 Please do a continuity check (inside the radio) between the top pin of the module connector, and pin 7, of the 12-way connector, on the back board, and then to pin 7 of the 12-way connector on the end of the 9Xtreme. 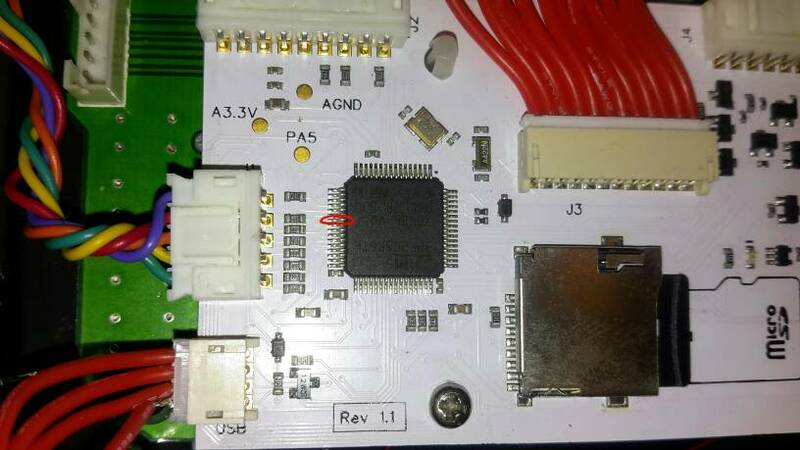 Then check this connects to pin 23 of the processor. REMOVE the battery while doing this check. Rather than a complete reload of the firmware, just create a new model. This while set it to the same defaults as a complete reload would do. I don't understand, how did he see the numbers changing on the trainer screen then, if PPM is not present on pin 1? It may be the loading on the signal. Maybe the output is not driving high very well. The trainer input is quite high impedance, perhaps the DJT needs more drive that is no longer there. I can only think that some damage has been done to the processor pin when removing the module with power on. Perhaps it is only driving in one direction, but that works on the trainer input but not on the DJT. My next suggestion is to test for this. This needs a resistor to be fitted, if you have one. A value between 1K and 3K3 would be suitable. You would probably need to solder a wire to one end of the resistor. 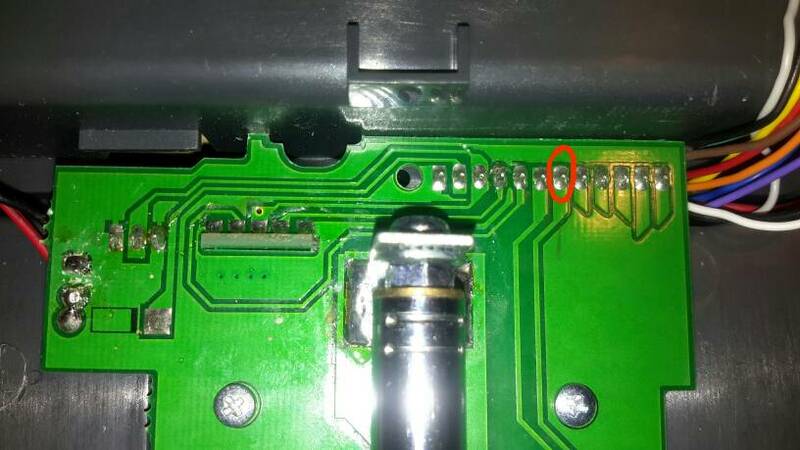 Connect one end to the PPM signal, most easily to the actual pin on the back board. Connect the other end to a 3.3V pad (5 or 10) on the expansion grid (provides a pull up resistor). Then test to see if the DJT then responds. If not, move the resistor from a 3.3V pad to a GND pad (provides a pull down resistor), and try the DJT again. Ok, thanks. I'll do it on Sunday evening as tommorow i'm on duty at my job. What is the expansion grid? Which is the ppm signal? The PPM signal is the one you traced above, and ringed in red. I posted a picture of the expansion grid earlier in the thread, it is where you connected the internal switched power wire. The second method with the GND to resistor seemed to work. It didn't flash the green led on the quad but red (searching for satellite), but i couldn't control it(couldn't arm the motors). 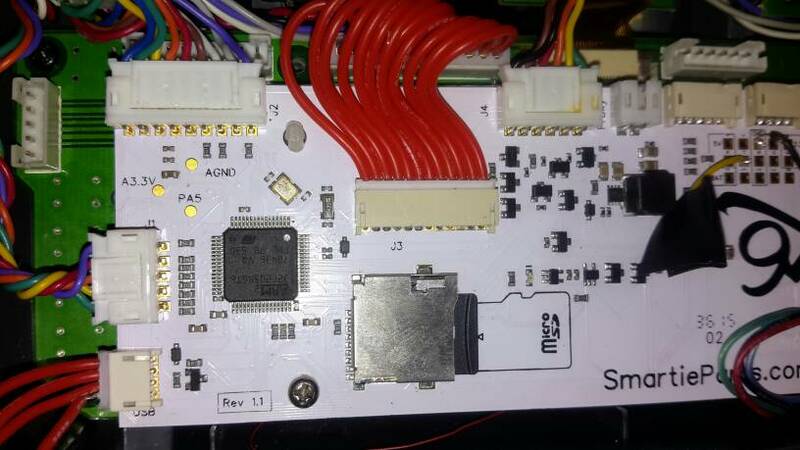 My turnugy is the old one which i hade to solder to connect the smartieparts. Is it possible that has to do with this or something moved and doesn't make good contact at the back of smartieparts? Please confirm that with the resistor to ground the green LED on the DJT, in normal operation, is on but flickering.